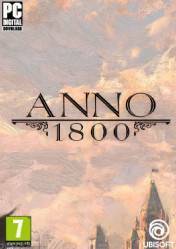 ANNO 1800 is the next title of the Anno de Ubisoft franchise, which will place us in the middle of the 19th century, at the time of the Industrial Revolution, which we must take advantage of to lead the world. We are at the dawn of the industrial age and the path we choose for this century will define the future of the world. We can be an innovator and bet on science and development, an explorer and reach new worlds unknown until now, a tyrant and oppressor leader, among many other styles of play and that will shape the world in which we move. We will start with practically nothing, and little by little, through trade agreements, investments in new technologies, political decisions and many other factors, we will create an industrial empire that will take us to the top of the modern age. Our only objective will be to build an empire that will stand the test of time. An innovative gameplay in the Anno series that will offer us endless possibilities and endings in our race to glory. The game graphics are beautiful the story line also, i watch a lot of videos of this game and i want to buy it when i has money for it! I also recomenned this game for everyone!! !